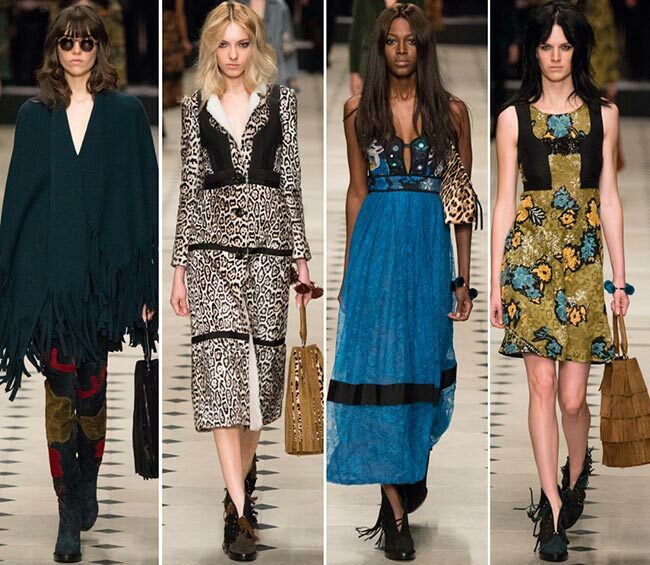 Chief Creative Director Christopher Bailey knows just how to tease Burberry Porsum fans it seems, offering us a rather delectable collection of 50 outfits perfect for the fall and the winter months of the end of 2015 and beginning of 2016. 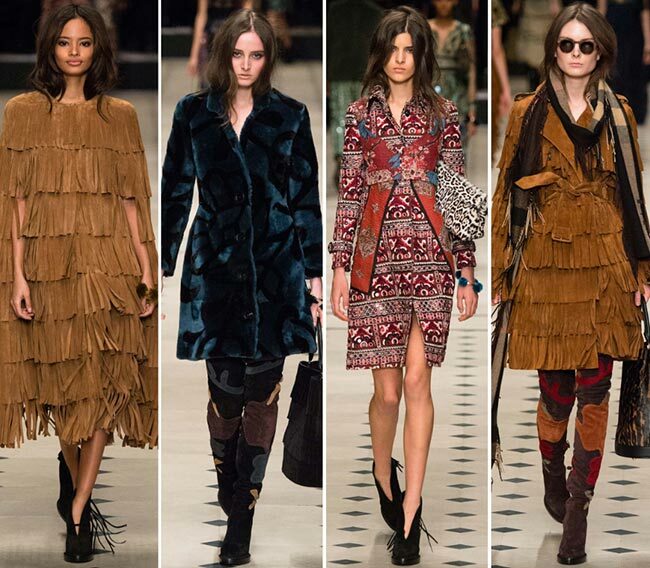 And boy, it was quite the treat, sweet and delicious, while we were told that the pieces of the entire Burberry Prorsum fall/winter 2015-2016 collection will be available the moment the show ends. Now that is probably the best news we’ve heard all day. 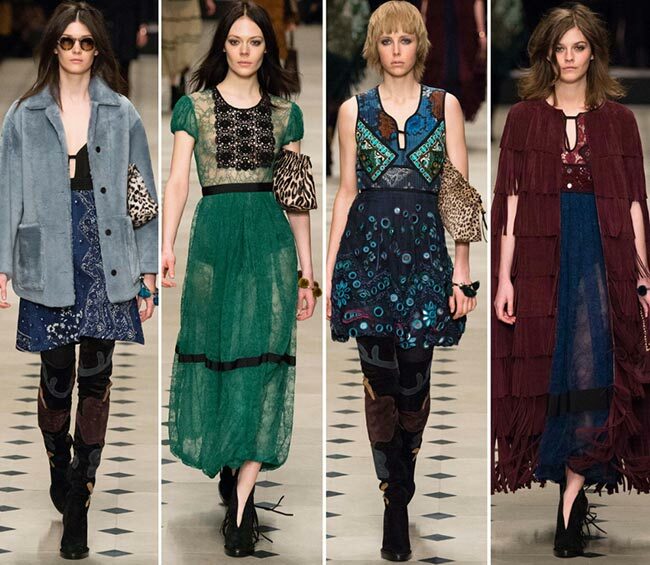 It was quite the audience too, at the Burberry Prorsum show on the London Fashion Week runway for the chillier seasons of the year. A full house, packed to the brink, wherein each individual was watching the runway with anticipation, indulging in the pleasure of all that is Burberry Prorsum. Christopher Bailey is in charge of all the designs of the products, as well as the advertising, and we can certainly strand for a round of applause after watching that incredible show. It was in 1856 that the Burberry fashion house was founded by the 21-year-old Thomas Burberry and in 2014 it was ranked 73rd in Interbrand’s “Best Global Brands’ report, making it one of the world’s most valuable brands seen today. It was in 1901 that the Burberry Equestarian Knight Logo was created containing the word “Prorsum’ meaning that the brand is heading forwards always and not looking back. It became registered as a trademark. We see the label’s signature trench coat reappear as well, something we look forwards to constantly, though many would not realize that the look was developed in 1914 when Burberry was commissioned by the War Office to create officers’ coats that would suit the conditions of contemporary warfare. Today, the trench comes in the iconic Burberry check, created in the 1920s and used as lining for the out garments. 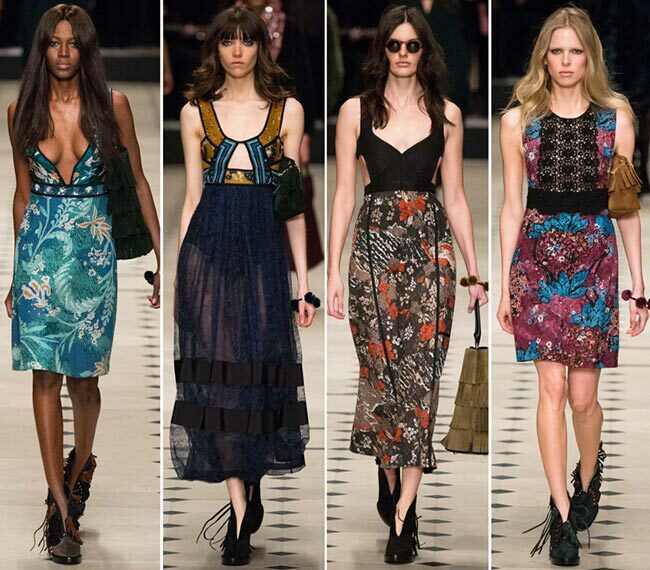 Today, Burberry Prorsum is one of the three lines it operates under, presenting the most fashion-forward collections that are centered around the runway shows and providing the design inspiration for the brand. The pieces presented on the runway today were truly lovely, a breath of fresh air so to say. 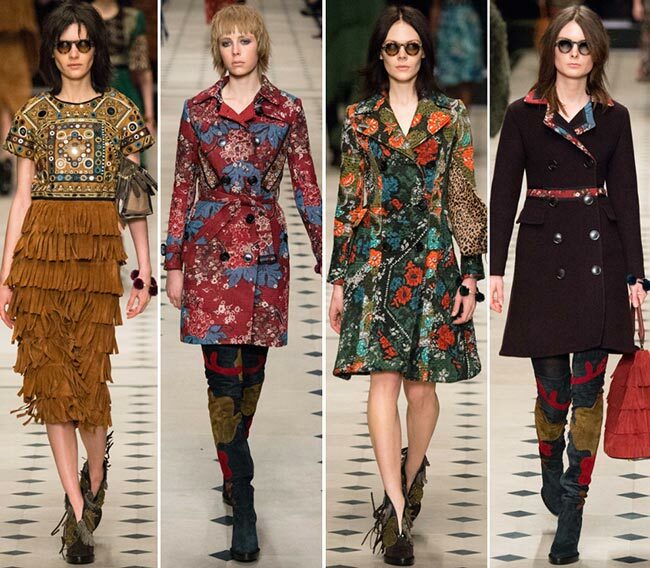 Plus, they stayed true to the bohemian inspirations of the 1970s spiced up with ’60s, with the floral prints and the layers of fringes, down to the shoes. It wasn’t just the catwalk that was full of stunning bits either, as supermodels took over the front row with Kate Moss and Cara Delevingne sitting alongside Naomi Campbell, Jourdan Dunn and Lily Donaldson. 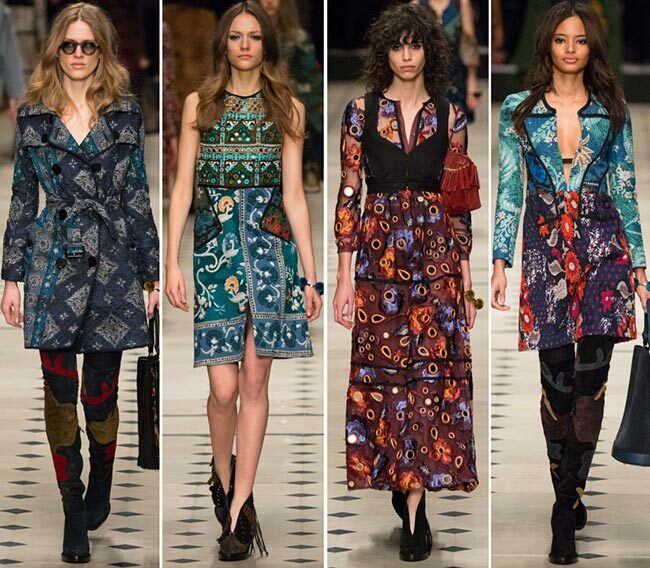 The Burberry Prorsum fall/winter 2015-2016 collection show was one of the biggest of the London Fashion Week and with good reason. This is one brand that can speak to our hearts and our fashion sense with ease. 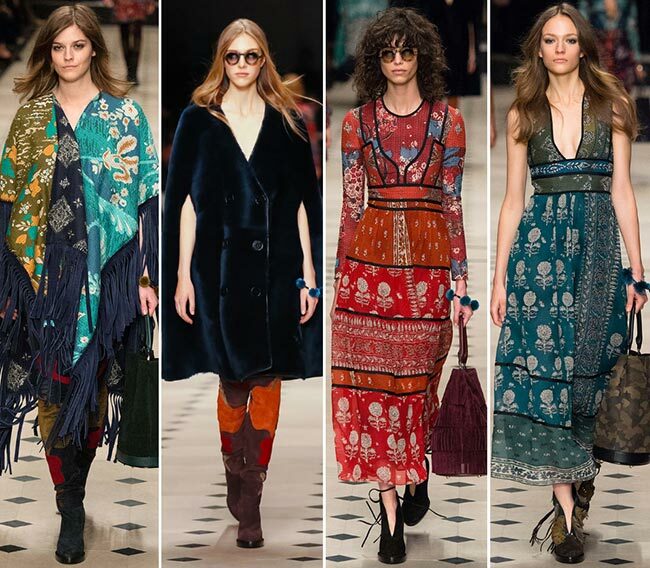 It was a color array of delicacies to be had, from the red blue and white floral patterned trench to the colorful blotchy suede thigh high boots, the swooping deep V plunges and the use of fringe everywhere, from the shoes to the handbags to the ponchos and accents on the garments. 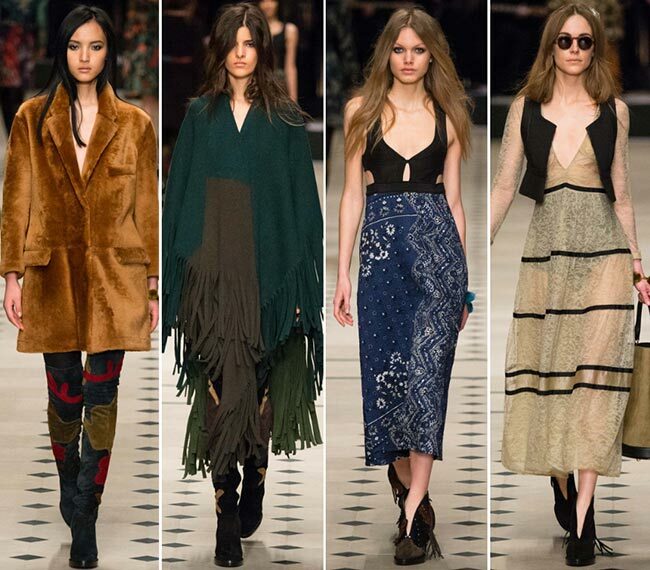 We saw the trending velvets as well as the slits up the middle of the midi skirts. We even had some animal prints make the equation, alongside spectacularly tailored dresses that will little knock your socks off. The funniest was probably the camel fringe dress that had a slit up the middle and was made of only that. With all the colors available through this collection, we are sure that the autumn and winter seasons will be far from boring!